If YouTube were forcing people to use their real name, I would be upset too. Fortunately that's not the case. For most YouTube channels, the best way to link your YouTube channel to Google+ without using your real name is to link your channel to a Google+ Page. But there are a few options that allow you to link your YouTube channel to a Google+ Profile that does not use your full name. What are your options for linking your YouTube channel to Google+? Note: if your YouTube channel is already connected to your personal Google+ Profile, you can move your channel to a Google+ Page Brand Account. What YouTube wants you to do is link your existing YouTube channel to Google+ so that your YouTube channel uses your Google+ identity. You can link your YouTube channel either to a Google+ Profile or a Google+ Page. The difference between a Google+ Profile and and Google+ Page is that a Profile represents an individual, while a Page can represent a brand, business, organization, or anything else that isn't a real person. While Google prefers you use your full name for your Google+ Profile, there are some exceptions. And Google+ Pages don't require you to use a name at all. You should have several options for linking your YouTube channel to Google+ that don't require you to use your full name. As I've mentioned above, the easiest option is to link your YouTube channel to a Google+ Page, but if you do want to use the same name for YouTube and other Google products and services, you may instead be able to create a Google+ Profile that doesn't use your full name. 1. link to a Google+ Profile that uses your YouTube channel username. Using your YouTube channel username on a Google+ Profile is only allowed if you create your Google+ Profile from your YouTube channel. Don't try to create a Google+ Profile with your YouTube name directly! 2. link to a Google+ Profile that uses only your first name and last initial. This option is explicitly allowed by the Google+ Profile names policy. No full name required! 3. link to a Google+ Profile that uses a pseudonym that you commonly go by. This must be a name that you personally commonly use to identify yourself, and NOT your brand name or business name. You may be required to submit documentation to Google+ demonstrating that this is the name you are known by. Note that most people do not use a pseudonym online that meets these requirements. Creating a Google+ Page is the easiest way to use an identity other than your name for your YouTube channel. It also allows you to have a different identity on YouTube than you use for Gmail and other Google products. Note that these options assume that you are starting with a YouTube channel that is unlinked from Google+ and that you do not yet have a Google+ Profile. If your channel is already linked to your personal Google+ Profile, you can unlink it. So how do link your YouTube channel to Google+ in a way that doesn't use your real name? If you do not currently have a Google+ account, you may be offered the chance to create a Google+ Profile that uses your YouTube username. If you choose to "use your YouTube name on Google" or "Use [username] everywhere", a Google+ Profile will be created with your YouTube username. That means that if your YouTube username is totallysuperawesomechannel, your Google+ Profile name will also be totallysuperawesomechannel. One important thing to keep in mind before you choose this option, however, is that "using the name on Google" means that your Google+ Profile name will also be used for other Google products like Gmail. If you don't want your email to be associated with your YouTube name, then this isn't the best option for you. 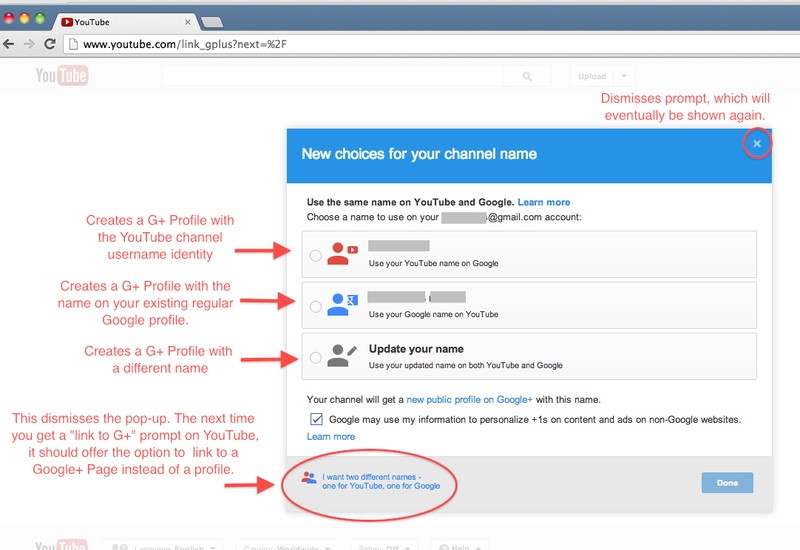 Also note that you can not directly create a Google+ Profile with your YouTube username. If you try to do that, your profile is likely to be suspended for violating the Google+ Profile names policy. This only works if you create your Google+ Profile from inside your YouTube account. And if you change the Google+ Profile name, the name you change it to must comply with Google+ Profile name policy. 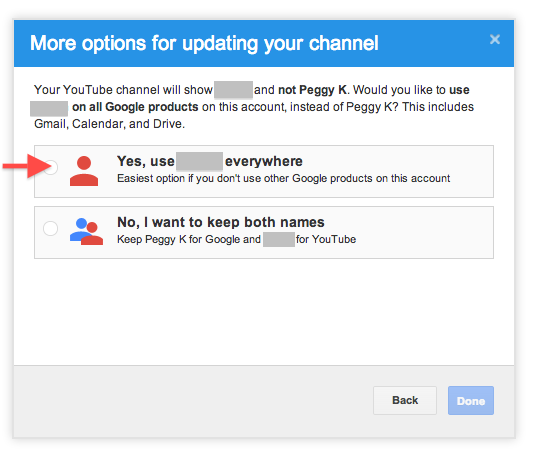 You are not allowed to change your Profile name from totallysuperawesomechannel to TotallySuper AwesomeChannel, but you could change it to Peggy K.
If your primary concern is that you don't want your full name to be used on your YouTube channel, Google+ Profile names policy explicitly allows you to create a profile using your first name and last initial (like Peggy K). You are also allowed to use your first initial and last name (J Smith). You may have noticed that there are a number of people on Google+ who seem to be using a name different from what's on their birth certificate. If you commonly use a pseudonym and are fairly well known, you may be able to create a Google+ Profile with that name. Scanned official documentation, such as a driver’s license or passport. Links to online locations where a significant community knows you by this name. Odds are you aren't going to be able to use this option unless you are widely known by the name you want to use. A typical forum nickname or gaming handle isn't likely to qualify. Why even mention it if it isn't a possibility for most people? Because it's asked about fairly regularly, and at least some of you out there might be able to use this information. My suggestion is that if you do want to create a Google+ Profile using something other than your legal name, you set it up and go through the appeal process before you link your YouTube channel to the Profile. That way if your Google+ account is suspended and your appeal is rejected your YouTube channel won't be affected. In my opinion, a much better option is to create a Google+ Page using your nickname or pseudonym. Google+ Pages are not required to comply with the Google+ Profile name policy. If you want to use a brand, business, show, or organization as your identity on YouTube, you should choose the option to link your YouTube channel to a Google+ Page, rather than a Google+ Profile. You can also create a Google+ Page with a nickname that doesn't comply with the Google+ Profile names policy. 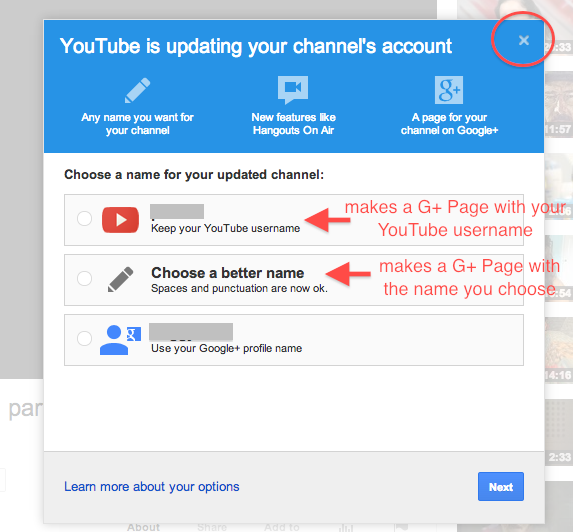 To create a Google+ Page from your YouTube channel, you need to be sure you are selecting the option to use two different names, one for YouTube and a different name for the rest of Google. 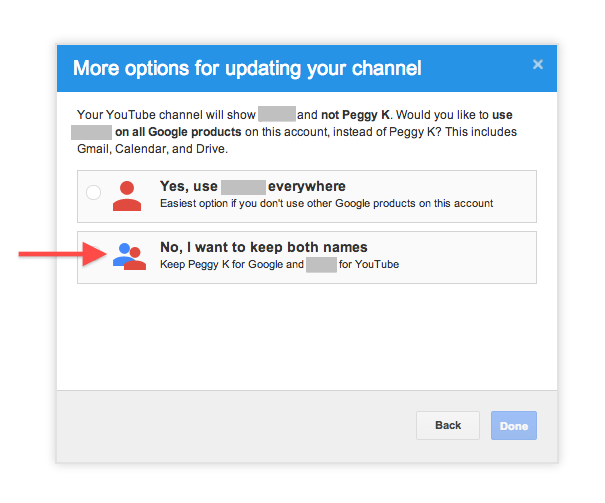 That option may be "I want to keep both names: Keep [full name] for Google and [username] for YouTube". "A page for your channel on Google+"
Because there is no way for anyone to see what personal Google+ Profile owns or manages the Google+ Page, this will keep your YouTube identity separate from your personal identity. I hate google+. There should be an option to delete it (forever), while retaining your good old fashioned youtube account, unmolested by Google. F*** Google+! They can kiss my plot! The comments above prove that changes need to be made to the commenting section of YouTube. Idiots with keyboards ruin the experience for so many others. If you think that you have any "privacy" with your clever screen names, here or on YouTube or anywhere else you're online - you're an even bigger idiot than your words let on. Excuse me, have you read the YouTube comments lately? Forcing people to use their real names won't make them behave. Idiots will still be idiots even if you force them to use their real name. The post is still as correct as it was 3 months ago. You absolutely do not need to use your real name when you connect your YouTube channel to Google+. You can connect your YouTube channel to a Google+ Page, rather than a Google+ Profile and the Google+ Page can be called whatever you like. If you don't want to use the Google+ Profile, a names suspension is easy to fix by just changing the profile to a first name and last initial. Once your Google+ Profile is unsuspended, and you've disconnected your YouTube channel, the Google+ Profile can be deleted. You can have your YouTube channel connected to a Google+ Page with no Google+ Profile at all. Sorry Vegan Helper, I accidentally removed your comment.